As the opening act on the 1998 Fairport Convention Winter Tour, guitarist/songwriter David Hughes posted a tour diary on the Internet. 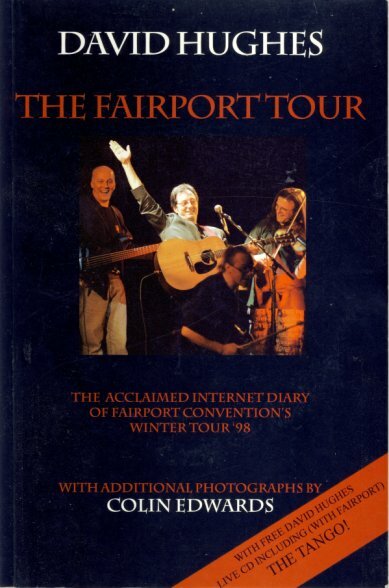 The Fairport Tour is the paperback version of that diary, complete with over 100 black and white photos, as well as a live 10-song CD he recorded on the tour. Hughes traveled and slept on the tour bus with the road crew, and his diary relates his day-to-day interaction with the crew members and Fairport. He paints a picture of a hard working, unselfish crew who went out of their way to make him feel comfortable. He also finds that life on the road isn't terribly exciting. (This account certainly puts to rest the image of Fairport as a hard partying band - their activities seem to revolve around the tour ping-pong tournament and finding the best curry place in town). Fairport fans will enjoy the photos and stories about the band. Anyone wanting to know the real story of what life on the road is like will find it here. "David Hughes can tell a story and he entertains. Warts and all, it's here...Cannily the whole tale is enlightened by a live CD in the back cover which proves Hughes to be not only a lively writer but an adroit songwriter to boot..."